What are the benefits of hydrotherapy beds? Clinical benefits of our hydrotherapy equipment include increased blood circulation, decreased muscle tension, increased oxygen absorption, decreased muscular toxins and increased release of endorphins. Other clinical benefits of hydrotherapy include decreased blood pressure, increased joint and muscular range of motion, increased muscle recovery, increased relaxation, and elimination of muscle guarding/spasms. How will the user feel during a whirlpool hydrotherapy session? While receiving a warm water massage with our machine, the user feels a powerful wave of water that has the ability to relax the entire body. The deep tissue water current provided by our hydrotherapy equipment provides an overwhelming feeling of relaxation. DTS Spinal Decompression Therapy, a traction based procedure, is one of the leading long-term treatment options for treating low back (Lumbar) and neck (Cervical) problems. Often, the pain in your back or neck is due to a bulging or herniated condition of one or more of the discs that act as a cushion in between the vertebrae that make up your spinal column. When your disc(s) bulge, are herniated, or simply wear out, the disc can press or pinch against a sensitive nerve, the result of which can be VERY painful. Over time, your body suffers from the wear and tear of daily living, as well as the overall effects of gravity. 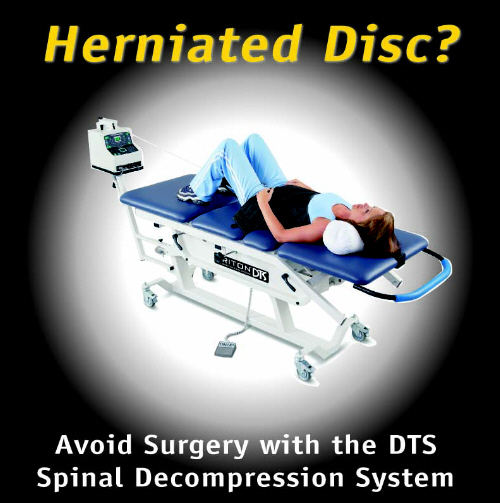 DTS Spinal Decompression Therapy helps to create a negative pressure in your disc (decompression). Decompression is the result of proper positioning and traction of your spinal column. DTS Spinal Decompression Therapy is an intuitive approach to help relieve the pain in your back and neck pain.